Solar bird baths create moving water with no electricity needed to operate a fountain. A solar powered panel is a part of the bird bath, although it often may be removed in the winter. The panel is located in the bowl and provides the power for a pump, which in typically hidden. The pump then circulates the water to keep it moving. Solar Powered Bird Baths - How Do They Work? The solar panel collects the sun's rays, turning it into a usable form of electricity. Because of this, energy bills are greatly reduced. Depending on the manufacturer and where you live, the panel may need to be removed in the winter. Many homeowners do not have outside electricity in which to operate a bird bath fountain. By using a solar powered bird bath, this solves that problem. In addition, a solar bird bath may be placed anywhere in the yard that receives direct sunlight. 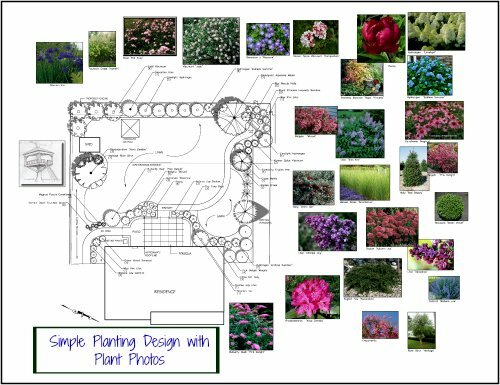 Whether it be put in the center of a garden or out in the open lawn, placement options are not limited. The pump circulates the water for the birds to drink and bathe in. This is healthy because the water remains fresh. Stagnant water attracts mosquitoes and can even become a source for the West Nile Virus. Therefore, a solar bird bath helps both the environment by conserving energy and also prevents disease for both birds and humans. There are many beautiful bird baths available that use solar energy. You can choose from various styles and heights. There are those on a pedestal. Some are just a simple dish, which look nice resting on a low wall. You may have seen those that have various dishes emptying from one to the other. This creates even more moving water and is fun to watch. Bird baths can be found made from many different materials, such as concrete, copper, composite materials and more. You can read more about bird bath fountains on my other page. or two, but eventually they will come and enjoy it. Place it in an area where it is easily seen so that you can watch them drink and frolic.You can create a nice habitat by adding a variety of bird feeders. 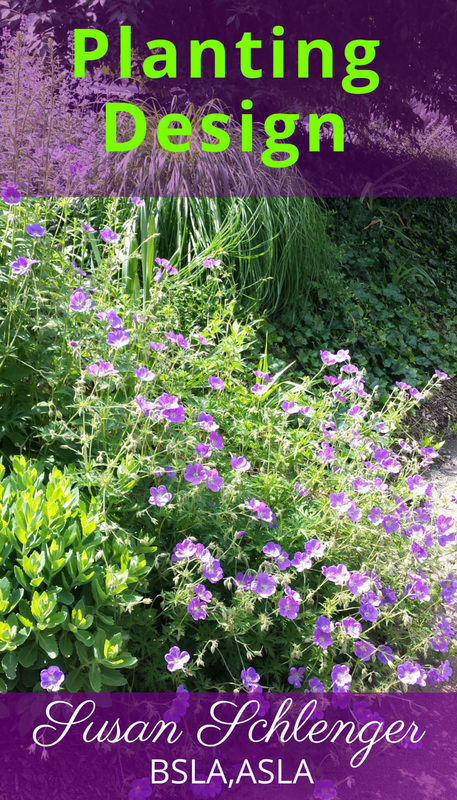 With some nice shrubbery for perching and shelter, birds will be regular visitors to your yard. For example, an inexpensive Forsythia bush will attract many, many birds. 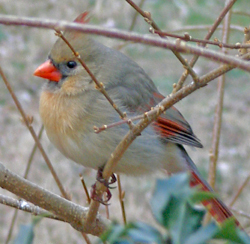 The picture above is a female Cardinal on the Forsythia. I often have a flock of them! The one disadvantage of a solar bird bath, is that the sun must be out to power the pump. If there are a few cloudy days, that energy will not be available and the pump will not work. The same is true for solar lighting. Therefore you must weigh the advantages with this one drawback. I feel all the pros of using this type of energy is worth it.